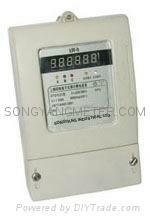 Application︰ SY1051 series Three Phase Prepayment IC Card Electronic Watt-hour Meter is a new type meter developed on latest SCM. With its prepayment management mode of "buy before use", it is a perfect product to effectively solve the problem of payment default in electricity consumption, avoid overload and tamper, control and regulate the load of power supply network. The active meter completely accord with relevant technical requirements of National standard GB/T17215-2002 and International Standard IEC61036. The reactive meter completely accord with relevant technical requirements of National standard GB/T17882-1999 and International Standard IEC61268. Functions and Features︰ 1. The user purchases electric power in advance and preset maximum load limit, alarm quantity and IC card password. IC card transmits data. 2. 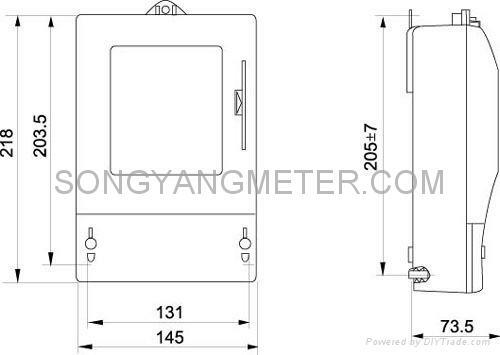 Storage of leave-factory serial number, meter constants, initial figure of the mechanical meter and user's name and address etc. 3. Backward reading of remaining electric power quantity, accumulated quantity of negative electric power and total number of purchases etc. 4. Alarm at low remaining electric power, alarm and switch off when overload and OK With cut off control. 5. After power cut down, data preserved forever. 6. The direction of electric power can be distinguished automatically, and has function of anti-stealing electricity. 7. May select many kinds of IC card, have IC card with code and data against false. 8. May select 6 digits LED display or 7 digits LCD display. 9. May select payment controls by kWh or money.